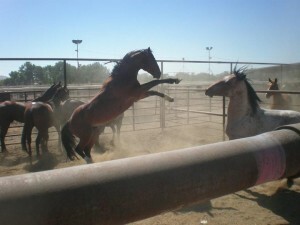 Lifesavers Wild Horse Rescue did it again: they scooped up another 100 horses that were about to be auctioned off to Mexican slaughter houses this weekend. After saving 172 wild horses from auction in June, the horse charity went back to the Fallon, NM, auction house and bid on more this weekend. They expected 175 horses on the block, but only found 105. With the help of other private buyers, they managed to save 100 of them, president Jill Starr announced on the group’s Facebook page this weekend. The average price was expensive: $375 per horse. Of course, that’s only the beginning. A vet check will run about $100 and after that it’ll cost about $100 a month to keep a horse. No one is sure where the horses came from, which made Jill suspicious. The Bureau of Land Management (BLM) is supposed to watch out for the nation’s horses, but they’ve always been conflicted caretakers. Their full-time whose full-time job is managing public land at cheap prices for ranchers. To accommodate ranchers, it has been cutting back on the horse’s range and numbers all along. The BLM lets 33,700 of its wild horses actually live in the wild. Another 8,800 live in corrals and 25,700 in Midwestern pastures, at a taxpayer cost of $29 million a year. Wild horses have special federal protection. They can’t be sold at auction unless the buyer promises basically not to slaughter them right away. So the BLM has been claiming that some of these horses running around like wild are really imposters, stray horses that just turned up en masse on public lands. And they were clever, too; they picked lands where wild horses used to be (until the BLM cleared them out). Jill says the June group did have some horses that were clearly let loose from a ranch, but many more that were just as obviously wild mustangs. Many of those horses get to go to the Born to Be Wild Sanctuary. Already about 80 horses get to live out their lives there. Lifesavers will be buying up other properties in the area and stitch together a bigger sanctuary. Horses that can be gentled and adopted go to Lifesavers Wild Horse Rescue’s main facility 90 minutes outside Los Angeles in Lancaster. You can come visit and see the horses. The last U.S. horse slaughter plant closed in 2007, but now horses just get shipped to Mexican or Canadian butchers. The Humane Society did a video on the hellish, dark trailers that ship the animals deep into Mexico. Some are walked across the border, then loaded onto double-decker trucks that are outlawed in the U.S., where they are crudely butchered, then exported as meat to Asia and Europe. The ASPCA says there’s a chance that shipping horses overseas for slaughter and human consumption will get outlawed thanks to a bill by Representative Jim Moran (D-VA). Prevention of Equine Cruelty Act (H.R. 503) bans shipping horses across state or national borders for slaughter. It has 184 bipartisan cosponsors but needs to get a date for a vote on the house floor. The USDA currently charges $70 for every horse going to Mexico–unless the equine is just going to slaughter. For horses destined to become meat, the USDA charges $5.50. The agency has been going through a long process of raising fees, but the killer buyers have gotten off very easy. Their fee will only go up 10% over three years. One easy way to cut down on horse slaughter: just raise the fee.